This blog post by Jayne Holliday, discusses findings from the recently completed research project on the ‘Conflicts of EU Courts on Child Abduction’ conducted by the Centre for Private International Law in collaboration with the University of Sussex and funded by the Nuffield Foundation. ‘Children should be seen and not heard’ is not the most enlightened proverb and is one that really ought not to be prevalent in modern judicial proceedings within the European Union in cases that affect children. Yet ‘children not being heard’ is precisely what is happening at the moment in intra-EU parental child abduction cases. What do I mean by parental child abduction cases? When people hear the phrase child abduction they often confuse it with trafficking or kidnapping but in these cases it is where a parent takes their child to another country to live without the permission of the other parent who also has custody rights. Many parents are unaware that to travel out of the country with their child they need the (usually written) consent of the other parent. Child abduction of this type is by no means a small problem. In 2014, Reunite, a charity that provides support for people involved in these cases, stated that there were over 500 cases involving the UK alone, with the most frequent destinations being France, India, Ireland, Poland, Pakistan, Spain and the USA. So what can a parent do if their child is abducted in this way? When a parent believes that their child has been abducted by the other parent to another country to live they are able to apply to the court to ask for the child to be returned under the 1980 Hague Child Abduction Convention. Under the Convention, the parents can also expect help with the process of solving the child abduction from the Central Authorities in the relevant countries. So far 94 countries or Contracting States have signed up to this Convention and as it only operates between these Contracting States it is necessary to check to see if the relevant countries are party to the Convention and whether it applies between them. For further information click here. If the 1980 Hague Convention applies (as it does in all cases between EU Member States) and the application for the return of the child is successful then the courts in the country where the child has been abducted to will decide whether or not to return the child. The process is supposed to happen quickly. Usually this works fairly well. The child and parent come back to the child’s habitual residence before the abduction and issues surrounding custody are dealt with there, working on the principle that those courts are best placed to deal with it. Sometimes the courts in the country where the child has been abducted to decide not to return the child under Article 13 of the 1980 Hague Child Abduction Convention. Article 13 contains the exceptions to returning the child: the left behind parent consented or acquiesced to it, the child would be at grave risk of harm or otherwise placed in an intolerable situation if they were made to return or the child themselves objects to being returned and is old and mature enough for those views to prevail. In the EU where a court in a Member State has said no to returning the child under Article 13 of the 1980 Hague Child Abduction Convention, the left behind parent uniquely has one more chance to ask for the return of the child. The Brussels IIa Regulation, which deals with parental responsibility and matrimonial matters, contains what on paper looks like a trump card. Article 11(8) of that Regulation allows the courts in the country of the habitual residence of the child before the abduction to consider what is in the child’s best interests and if they disagree with the non-return order they themselves can issue an order to return the child. For that return order to be enforceable it needs to be accompanied by an Article 42 Brussels IIa Regulation certificate. This is to certify that the child has been given an opportunity to be heard in order to see whether they object to being returned, that both parents have been given an opportunity to be heard, that the court has taken account of the reasons for the non-return, and where applicable, measures to ensure the protection of the child on their return have been put in place. Professor Paul Beaumont and I (from the Centre for Private International Law at the University of Aberdeen) and Dr Lara Walker (from the University of Sussex), as part of a research project, gathered case law from every Member State within the EU where a left behind parent had initiated these Article 11(6)-(8) Brussels IIa Regulation proceedings. The aim of our research was to assess whether the courts were following the requirements needed to issue the Article 42 Brussels IIa certificate; one of those factors being whether the child had been given an opportunity to be heard, with their views being given due weight in accordance to their age and maturity. This proved to be easier said than done, as many of these cases are unreported. After eighteen months of research – working with Central Authorities and volunteer researchers in every Member State, NGOs, judges and practitioners – a total of 66 intra-EU cases were collected and then analysed. All of these cases involved Article 11(8) Brussels IIa proceedings but not all the proceedings led to the decision to order the child’s return. However, out of these 66 cases, involving a total of 70 children, it turned out that only 14 children were heard by the courts usually through the Taking of Evidence Regulation. The question we then considered was why were these children not being heard? Could it be that the age of the children was a justifying reason? The data proved to be concerning. We found that children as old as 15 had not been heard by the court even where the reason for not returning the child in the first place under the Hague proceedings had been due to their objection to being returned. Also, children under 12 were routinely not being heard in certain Member States. The national laws of some Member States require that all children are to be given the opportunity to be heard from the age of 12 even when it is commonly understood that children as young as 6 are routinely heard in some Member States in Hague cases, or even from 3 years of age as is the case in Germany. The original reason for the child being 12 years of age is that certain Member States held the view that they needed to protect the child from conflict and they could do this by keeping them away from the courts. However, this approach does not fit easily with the right of the child to be heard. The right of the child to be heard during civil proceedings that affect them is a requirement under international law within Article 12(2) of the United Nations Convention on the Rights of the Child and at EU level within Article 24(1) of the Charter of Fundamental Rights of the European Union, and is theoretically protected within these cases by it being a requirement of the Article 42 certificate before a return order can be enforced. But with only 20% of the children in these cases being heard, it is clear that the courts are failing to protect this right . Additional reasons for the courts not hearing these children were also identified. In addition to the abducting parent in some cases obstructing the child’s opportunity to be heard, a lack of technology was put forward as a reason in many Member States. Not every Member State has arranged for video conferencing facilities to be available to the courts or if they have there is inadequate access. In an age where everyone with a mobile phone is used to having the ability to communicate easily and inexpensively with someone in another country it seems incredible that Member States have not yet put the infrastructure or the manpower in place to support the Taking of Evidence Regulation. But as with all things in life it comes down to a lack of money or in some cases a lack of prioritising the protection of the most vulnerable parties. Not everything turned out to be doom and gloom. The sheer number of children not heard in these cases was indeed unexpected but it was also encouraging to see that some Member States were working hard to implement change. Judges told us that they now receive training on how to hear the child, and/or they are able to bring experts in. Rooms are being set aside in court buildings that are considered to be a less imposing environment than the court room for a child to be heard in. It is clear that some Member States in the European Union are slowly making the changes needed to protect the rights of the child. With the revision of the Brussels IIa Regulation imminent we were able to send our interim findings and recommendations to the EU Commission. We await the outcome of the review with interest. A brief summary of our findings and all the EU country reports can be found on the Centre for Private International Law’s webpage. For those of you who are interested in finding out more, our overall findings from the research will be published in “Conflicts of EU courts on child abduction: the reality of Article 11(6)-(8) Brussels IIa proceedings across the EU” (2016) 12 Journal of Private International Law (forthcoming). Scottish land reform – cool for cats? This blog post, by Malcolm Combe, explores Scotland’s newest land reform law. For those short on time, more selective and succinct coverage is available in this article in The Conversation. On 19 April 2016, the Land Reform (Scotland) Act 2016 received Royal Assent. This final step of the law-making process signifies that the reigning monarch has rubber-stamped a statute passed by elected representatives, in this case Members of the Scottish Parliament. Those with a sprinkling of public law knowledge will know that the Queen does not readily withhold Royal Assent, so her personal views about a law or its potential impact on her are not normally scrutinised. In the wide press coverage of the run-up to and passage of this land reform legislation, there was a curious challenge to this norm. 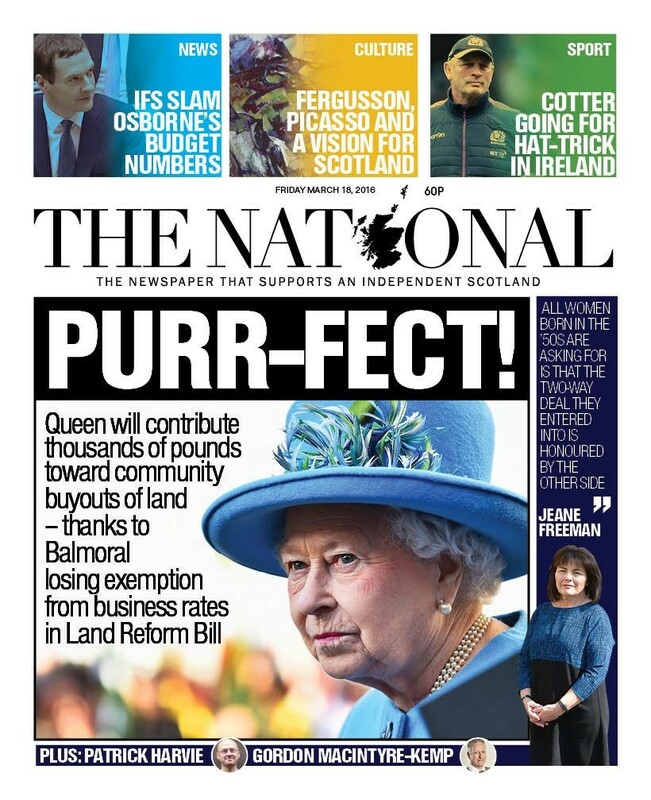 A tweet and an associated front page splash from the newspaper The National proclaimed the following: “Purr-fect news for communities as Queen’s new tax bill pays for buyouts”. The Queen… will face an annual levy of thousands of pounds on her Balmoral property. Others who face paying the new tax include the Duke of Buccleuch, who is in charge of a sporting estate at Drumlanrig Castle in Dumfries and Galloway. The Duke of Buccleuch (reported to be Scotland’s largest private landowner) and the Queen might make for handy, high-profile figures to be “land reformed”, but others without as much nobility or indeed land will be affected by this measure. Meanwhile, there are other measures in the Land Reform (Scotland) Act 2016 beyond the reintroduction of sporting rates which could also impact on a wide range of people. So is the Land Reform (Scotland) Act 2016 “purr-fect” – sorry, time to scratch the cat imagery – perfect news for communities? Before answering that, it should be recalled that this new statute is not the full story. This is not Holyrood’s first dalliance with land reform. In fact, we now have two Land Reform (Scotland) Acts, one from 2003 and a younger namesake from 2016. The 2003 Act gave everyone the right to access Scotland’s land and inland waters, even without an owner’s prior consent, provided such access is taken responsibly and subject to certain exclusions relating to the character of land. It also provided for some rights of community acquisition, in rural areas and in the crofting areas of the north and west of Scotland. Important as those innovations were, calls for further land reform in Scotland continued to be made from some sections of society. Such calls were answered in part by the Community Empowerment (Scotland) Act 2015. As its name suggests, that legislation aims to empower communities, which it does by giving them a number of entitlements to participate in local decisions and a new right of acquisition for abandoned, neglected or environmentally mismanaged land. It also widens the right of first refusal the 2003 Act introduced to rural Scotland by expanding it into Scotland’s cities. Another answer to those calls is now found in the Land Reform (Scotland) Act 2016. This newest land reform statute contains a mix of measures. Two of those might lead directly to a change of landowner, either in terms of a community buying land to further the cause of sustainable development, or by allowing a secure agricultural tenant (more on such agricultural tenancies below) to buy land from her landlord in certain circumstances where that landlord is in material breach of a court order or an award made at arbitration. Land reform can be about facilitating a change of ownership, but this land reform statute does far more than that. There are important changes that aim to make land reform a more permanent feature of the legal landscape, particularly a new non-party body called the “Scottish Land Commission”. When it is fully staffed and mobilised, the Commission will have a role in ensuring land reform stays in the foreground of Scottish policy, whilst maintaining proper oversight of the various measures that have been introduced. Further innovations include the promised “land rights and responsibilities statement”, which will be a standard against which landowners will be measured in future, and guidelines for engagement with local communities when important decisions are made by landowners. A matter sometimes related to community engagement is whether a community knows who to engage with, as there have been occasions when an entity owning land in Scotland might not be entirely transparent (an issue which resurfaced with the recent “Panama Papers”). One part of the 2016 Act is designed to boost transparency. Together with a drive to complete the map-based Land Register of Scotland by 2024, new rules relating to the disclosure of who has a controlling interest of a landowning entity might mitigate such issues in future. Completely unrelatedly, but potentially leading to a similar effect, the UK Government has recently announced an anti-corruption push which will similarly lead towards transparency of landowning entities. What else does the 2016 Act do? There is the already mentioned fiscal step towards land reform, changing the treatment of shootings and deer forests – or, to be exact, removing a relief that was conferred in the 1990s. Evidently this could have the effect of steering landowners towards a different use, depending on whether landowners are able to pay the rates, although some businesses may be able to benefit from other reliefs (such as those for small business) if they are eligible. Deer management will also be affected by a regulatory as well as a fiscal change. Large areas of Scotland are given over to deer, which just about explains why deer feature in this newest of land reform statutes. An important ecological consideration is the lack of any natural predator, which necessitates human management of deer populations. Amongst other things, the new law will allow for the imposition of deer management plans in certain circumstances and will provide a power for the relevant authority to request information about a landowner’s planned management activities, rather than simply report on what has taken place (as was previously the case under the Deer (Scotland) Act 1996). What if you want to go for a walk in an area where deer are found, or indeed anywhere else in the great outdoors? You still can. There are some technical reforms to the rights of access introduced by the 2003 Act also included in the 2016 Act, but these largely leave the existing rights as they were. (Incidentally, walking through an estate where legitimate deer management activities are taking place is probably not to be recommended.) There is also a technical reform to the regulation of “common good land” by local authorities, aimed at averting one of the issues that arose in relation to a new school in Portobello (analysed in this Edinburgh Law Review contribution (PDF)). The last point to mention about the 2016 Act relates to its effect on the law of leasing, or at least two technical areas of rural leasing. The first affected area will be small landholder legislation, something of a niche area of landlord and tenant law. There is a commitment to review that legislation, with no indication yet of what changes might follow for Scotland’s relatively few remaining small landholders. Much more importantly, and in some cases controversially, there are a raft of reforms to the agricultural holdings regime. For many years, tenants with a certain type of agricultural lease have enjoyed something called security of tenure. This allows the tenant (and, in some cases, a successor or a transferee of an original tenant) to keep the lease of the rented property even after the original contractual term has finished, provided they have paid rent when due and generally maintained the property properly. There has been a perception for a number of years that this system has not got the balance between the interests of tenants, landlords and indeed society as a whole quite right. The regime has contributed towards an environment where landlords often seek recovery of “vacant possession” of the land whenever they can, and traditionally this might have happened when there is a “break” in the succession of a lease. Aware of these issues, the Scottish Government appointed a specialist group to consider agricultural holdings legislation, which reported in 2015. The work of the group is reflected in the 2016 Act, which introduces two new types or rural leases – the repairing lease and the modern limited duration tenancy – and reforms the law relating to matters like rent review, assignation (transfer) and succession (inheritance). Those changes to assignation and succession do not allow a lease to be passed to absolutely anyone, and as such the landlord still has a chance of getting the land back without being subject to a lease if there is no-one suitably close (in terms of relationship by blood or marriage/civil partnership) to the outgoing tenant to take it from them. That said, late in the parliamentary process a reform was made which might allow a secure lease to be passed to someone outwith those recognised proximate relationships. This controversial, and highly complex, reform will change the law in a way that makes it more difficult for a landowner to wash land clean of a lease. The current position is being changed to a position where an outgoing tenant can effectively cash-in the tenancy. The 2016 Act does still allow a landlord to get the land back, but not for free: it introduces a mechanism for the landlord to pay a sum to the tenant to buyout that lease. Where the landlord does not wish to buy it out, the tenant can then assign the lease to “an individual who is a new entrant to, or who is progressing in, farming”. As noted, this is a complex area, so it is not possible to explore this matter fully here, and there have been indications that landowners may challenge this particular reform on human rights grounds as an unfair interference with their property rights. Scottish legislation is susceptible to challenge in court, if it is not within devolved competence, for example by not being compatible with the European Convention on Human Rights. This was witnessed in the Salvesen v Riddell case (about an earlier agricultural holdings reform, which lumbered some landowners with a secure lease without compensation in a fashion found arbitrary by the courts) but not in the Pairc case (about a challenge to the crofting community right to buy (for value) in the Land Reform (Scotland) Act 2003, which was held to be a policy that was properly within a state’s margin of appreciation). If litigation was to follow in relation to the 2016 Act, suddenly the courts would have a role in the final approval of the law, which would mean the Queen’s Royal Assent would not be the final step after all. The 2016 Act covers a lot of legal ground. It will make a difference to landowners, land managers, communities, tenants and Scottish society as whole. That being said, it could have covered more ground still: for example, there have been suggestions about a cap on landownership above a certain level, restrictions on landholding entities registered outwith the EU, and the possible introduction of compulsory sale orders. None of those appear in the 2016 Act. This suggests land reform activists might not think the 2016 Act is perfect after all, but what about landowners? Land reform is not exactly the kind of thing that will always please existing owners, but the one highlighted example about agricultural holdings reform demonstrates that they do have specific concerns which might yet lead to litigation. Regardless of who is purring at the end of all this, the promised Scottish Land Commission, the preparation and ongoing review of measures to do with community engagement and land rights and responsibilities, the post-Holyrood election climate, and a new Cabinet Secretary for the Environment, Climate Change and Land Reform are all mixed together, it is clear that land reform is not going to retreat into the background any time soon. Indeed, the recent Holyrood election campaign demonstrated that many political parties are committed to further land reform. The fact that the Scottish National Party lost majority control of the Chamber means it will be looking for support from other political parties to implement its plans, which will have implications for any further land reform legislation. No attempt has been made to contact the Queen to ascertain whether she is purring at the prospect of all of this, but one final feline observation might be made. Surprisingly, The National was not the first newspaper to juxtapose cats and Scottish land reform. 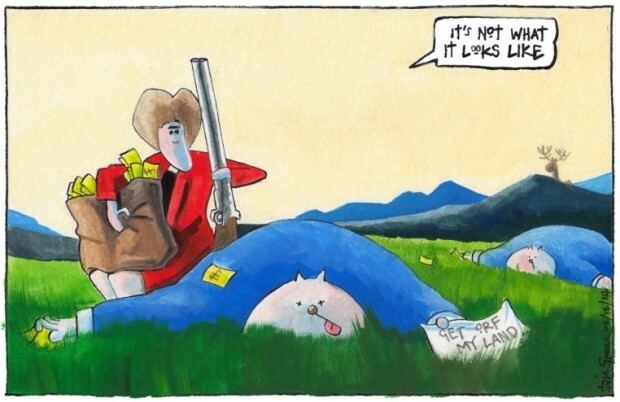 The Scotsman got there first, with this cartoon from Iain Green appearing in December 2014. Reports that Nicola Sturgeon has declared open season for fat cat lairds have not yet been confirmed. Further analysis of some of the new measures can be found in this article in the Journal of the Law Society of Scotland, the professional journal of Scottish solicitors. That contribution looks at the new community right of acquisition, the framework for community engagement and the new Scottish Land Commission in more detail, but skims over deer management, the change to the fiscal treatment of shootings and deer forests, and agricultural holdings law. Those wishing to read even more on this topic will find that land reform is something of a recurring feature at Malcolm Combe’s personal blog: basedrones.wordpress.com. He also has an article on redistributive land reform in the next issue of the Environmental Law Review, an open access version of which is available here. This blog post is by Dave Lorimer, an LLM by Research candidate at the University of Aberdeen. In this post – the second this blog has hosted from a postgraduate student – he reflects on a recent interdisciplinary event at the University of Aberdeen. The inaugural Granite Symposium on 25 April 2016 provided a good opportunity to present some postgraduate thoughts. The event allowed discussion of interdisciplinary issues, in particular where the social sciences meet technology, with a view to publication in a special edition of Granite Online Journal . The keynote presentation by Prof Karen Kelsky was an enlightening review, albeit a very trans-Atlantic one, of where to go after ‘grad school’ and how to get there. Tricky questions for many of us. There was some thought-provoking advice about pacing the publication of research and how to tie it into an academic career. For my part I presented on my latest numerical analysis on aspects of the criminal law. Having had an interesting and varied career as an engineer in the oil and gas industry, my early retirement (at a time when ‘bean-counting’, diminishing local reserves, standardization and ‘business modelling’ was taking much of the creative fun out of engineering) allowed me to pursue a life-long fascination with the law. It struck me in the course of my LLB that there were a number of analogous processes in the logic of the law and the logic of engineering. In fact, much of the work towards the end of my engineering career was primarily determined by a Law Lord. The technical quality of Lord Cullen’s report on the likely chain of events leading to the Piper Alpha disaster would have made any experienced engineering professional proud. His review and recommendations on the use of Quantitative Risk Assessment (QRA) as a predictive tool in industrial safety management, for me at any rate, now resonate with a defeasible approach (as often used in artificial intelligence work) to assessing the ‘unknowable’ using the logic of numbers in a legal context; QRA predicts the likelihood of possible future events in order to identify the optimum approach to the best outcome – so why not seek to apply the same logic to the understanding of past events? So far I’ve worked on four discrete numerical applications within the area of criminal law. I presented separately on the first three at Strathclyde and Aberdeen, namely: 1) the risk reducing nature of corroboration with respect to wrongful conviction; 2) a numerical view of the criminal process as a chain of events; and 3) an exculpatory assessment of defence witness reliability in a murder case-study. The Granite Symposium allowed the opportunity to present on the fourth: a numerical assessment of information transfer by witnesses at trial. Each time I present, not only do the ideas under consideration become better understood but new facets are revealed in the process of receiving feedback from the audience, which ultimately strengthens and further develops the thinking. Event occurs – Witness perceives – Witness reflects – Witness recalls – Witness testifies – Jury perceives – Jury reflects. The idea of ‘reflection’ after perception comes from David Hume (the philosopher, uncle of the institutional writer Baron David Hume) as do a number of other ‘Kantian’ concepts (the possibility that Kant believed he had a Scottish grandfather makes one wonder if he had read Burns too; ‘To see oursels as ithers see us’, ‘A man’s a man for a’ that’ and ‘That sense and worth o’er a’ the earth’ are well reflected in Kant’s moral philosophy; in this author’s humble view, they represent the Scotsman’s equivalent to Kant’s Categorical Imperative and its various formulations). neuroscience research, raising the question of whether Magnetic Resonance Imaging (MRI) scanning of the brain (known as functional MRI or ‘fMRI’) could lead to real-time assessment of information transfer accuracy at any or each of the seven stages. The state of the art with respect to the current size of MRI machines presents obvious practical issues with this but the idea that one day witnesses (and even jury members??) could wear an MRI scanner as a hat, may ultimately make polygraph (lie-detector) machines as obsolete and humour-inspiring as the wind-up gramophone. The initial perception that this fourth and latest numerical application was of little more than scene-setting or background interest turned out to be wrong, at least as far as the Granite Symposium feedback is concerned. Some interesting ideas have been generated and the strength of the analysis – as in many if not most numerical assessments of this type – is not necessarily in the final arbitrary or defeasible numbers generated. As with experience in numerical risk analysis in industrial projects, much of the real value is in the analytical process of categorising inter-related parameters and the comparison of a range of inputs from a cause and effect perspective, as well as development of deeper understanding of the overall process and identification of key issues and new ideas. This is at the heart of a reasoning process and the numerical approach may be seen as a thread that binds or a link that chains – or even a kernel that continues to grow. As far as academic presenting is concerned, any form of peer review – which includes presenting and discussing the issues with people of sound intellect and experience, plus any ‘digital dialectic (reasoning)’ such as blogging – also becomes part of the research and reasoning process. In fact, with respect to the research under consideration here, it seems at first thought perhaps a pity that jury members no longer get to question witnesses directly… but that’s another story. Recently, the Lord Chief Justice of England and Wales, The Right Hon. The Lord Thomas of Cwmgiedd, argued that the balance between litigation and arbitration as processes for resolving commercial disputes under the English and Welsh system had been taken too far in favour of arbitration. I was interested to read Lord Thomas’s points from the Bailii Lecture 2016 (PDF) as, on the face of it, they go against almost everything I have read and that I hear about the litigation-arbitration debate. I have to say I disagree with the tenor of what he said in his speech. Before setting out why I disagree, let me be clear about two things. Firstly, I do agree that the choice of method of resolution of a commercial dispute is a complex one, dependent on many factors. Secondly, arbitration is not perfect as a process, even if it is deemed to be a suitable method in any particular case. However, the speech delivered appears to be based on the notion that what is important is the development of the common law by judicial decision making. In my view, that is rarely, if ever, a matter of any priority for those in commerce who become involved in disputes. What they care about are issues such as: cost, speed, confidentiality, quality of decision making and enforceability. Now, I am not suggesting that arbitration always lives up to its billing in these areas, but I believe that it delivers a better process and outcome more often against these factors than litigation does. Lord Thomas suggests that the criteria for appealing an arbitral award could be relaxed. However, that would give rise to an increase in unpredictability. The suggestion that arbitration stifles contribution to the development of the common law, even if a valid consideration for the parties (which I doubt), is not really borne out by the significant volume of arbitral appeal cases which end up in the English Commercial Court. Litigation has its place, of course, but not as a means to allow the development of the law. In my view, it is not there for that purpose. The courts and the law are there to serve the public, not the other way around. What is striking in today’s era of the search for better systems to resolve commercial disputes (an era which exists globally) is the suggestion that more appeals from arbitral awards (which could come from relaxing the grounds of appeal) would be a good thing. Those in the commercial sector who would pick up the costs of such additional appeals would not, I suspect, be thankful that their payment had contributed to the development of the common law. It strikes me that the right approach to concentrate upon is having an understanding of all the methods available (whether mediation, litigation, arbitration, expert determination), ensuring that those who negotiate have the skills to do so effectively, and judging when any post-negotiation method might best be used. In my view, this is the future, not one where we consider the development of the law via litigation as an important aim in itself. Derek has a keen interest in dispute resolution processes (court, tribunal, arbitration and mediation). He is the Programme Leader of our online LLM Dispute Resolution.